The move command, as the name suggests, is use to move one or more objects from one point to another of the drawing. It is activated by clicking on this icon which is on the "modify" toolbar. At this point, the crosshair cursor changes to a selection handle and on the “command line” is write, “select objects”. You must now select one or more objects to move and you can do so by clicking on each one individually or by selecting one or more windows, then we need to confirm your selection by pressing Enter or the right mouse button. Please note, before pressing enter you can remove items from the selection made, by holding down the “shift” key on the keyboard and simultaneously selecting objects to remove, individually or with a selection window. 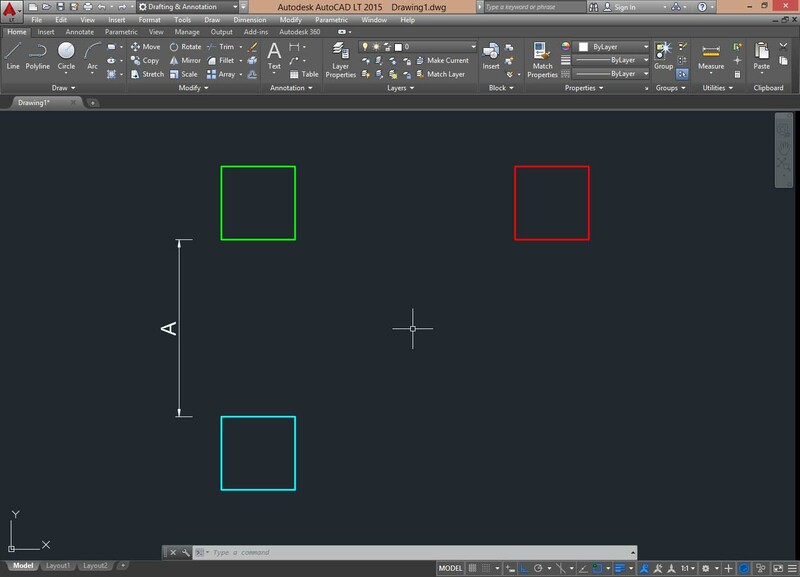 This is a general concept to remember, regardless of use by various commands in AutoCAD, (I mean also without start any command) you can select objects by clicking on it and deselect it again by clicking while holding down the “shift”, or by pressing “esc” you deselect all. The selected objects change their appearance becoming highlighted. - The starting point from which move objects. - The destination point where we are going to put objects, relatively to the first point selected. This means that if you move such as a square, you can select as a first point of displacement, an angle of the object (using the snap), or even a point outside the object, as the vertex of another object or a random point on drawing area. Well, if you want to move the blue square under the red, but maintaining the distance (A) between them, you can select as the first move point a corner of the green square and the same corner as the second point on the red square. If you want to attach the blue square below the red, will be choose as a first point one of the two vertices on the top of blue square and as second point one of the two vertices in the bottom of the red square. 5) Select the second point of destination and exit the command.